It was a tough week on Wall Street as Ukraine fears resurfaced. Click for more data. 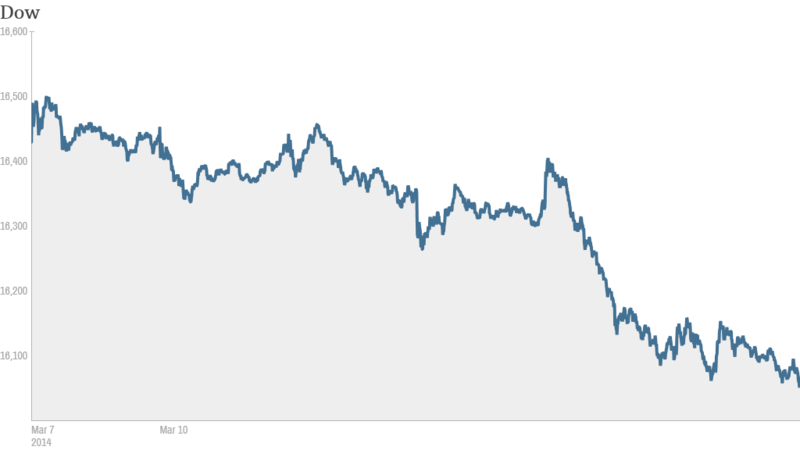 Stocks closed lower on Friday due to more worries about the political climate in the Ukraine. 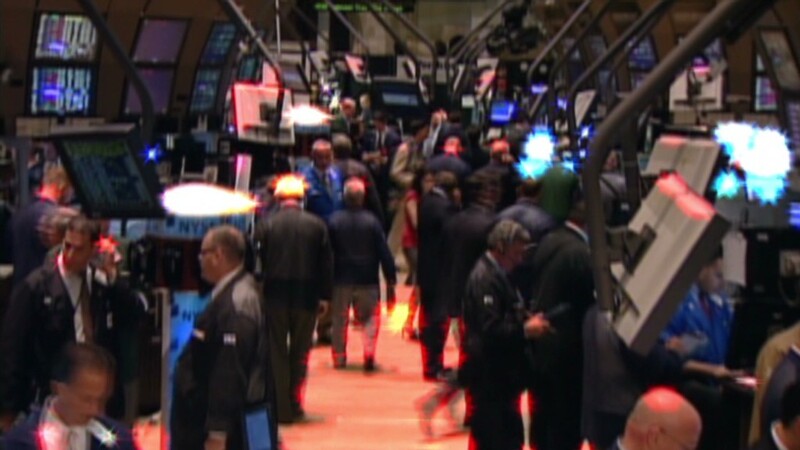 The Dow, the S&P 500 and the Nasdaq were all down about 2% this week. Most of the losses came on Thursday. It seems that a sense of unease is returning to Wall Street lately. The VIX (VIX), a key gauge of volatility, was up 9% Friday and has surged 25% this week. And CNNMoney's Fear and Greed Index, which looks at the VIX and six other indicators of market sentiment, has plunged into Fear mode. It was showing signs of Extreme Greed just a week ago. Investors are bracing for Sunday's referendum in Crimea, where voters will decide whether to break away from Ukraine and join Russia. Ukraine and the West have described the vote as illegal. They have accused Russia of violating Ukraine's sovereignty and are threatening sanctions. Russia's benchmark index had its biggest weekly drop in two years, down more than 7%. For the year the index is down more than 17%. The Nikkei in Japan dropped more than 6% this week. Recent poor export figures from China have sparked worries about the pace of growth in the world's second biggest economy and has sent some investors to seek safety in Japan's yen. Keith Springer of Springer Financial Advisors said that while developments in Ukraine are certainly important there was little else for traders to focus on today. With little in the way of major earnings or economic reports, he said it is "nap season" for investors. Springer added that investors are, "hanging on headlines, and headlines are never good." In corporate news, shares of Aeropostale (ARO) plunged after the retailer reported a bigger-than-expected loss and drop in revenue for the most recent quarter. It plans to close 52 stores this year. General Mills (GIS) shares were also lower. The maker of Cheerios and Yoplait yogurt warned that third quarter profits would be below Wall Street forecasts. Keurig Green Mountain (GMCR) surged after the company amended a deal with Starbucks (SBUX) to expand the variety of Starbucks single-serve offerings. The K-cup originator also announced a deal with Peet's Coffee & Tea. The stock has been red hot this year, surging 50% thanks largely to optimism about a new partnership with Coca-Cola (KO). Coke also is taking a stake in Keurig. On StockTwits, trader sogenerous told investors shorting the stock to get out of the way: "$GMCR deals with Starbucks, Peets Coffee, Coke now, 2 monster earnings beats. $1B investment from $KO. What is short thesis?" Shares of Liberty Media (LMCA) climbed after the company said that it was no longer making an offer for all of Sirius XM (SIRI). Liberty currently own 53% of the satellite radio provider. And shares of Castlight Health (CSLT) soared in their market debut. The healthcare software company priced its initial public offering at $16 and surged nearly 150%. One trader was cautious on the stock. "$CSLT I bet there will be some serious flipping from people that got allocated shares. Too much unknown over the next 30 days to hold." wrote creativeflood. But FoxW didn't sound worried and took a longer term view. "$CSLT You guys would have to know more about their future to know why this isn't insane, this will be huge. Their revenue growth will be huge." Shares of Activision Blizzard (ATVI)are trading near an all-time high. The video game stock is among the top performers in CNNMoney's Tech 30 index this year. Video game retailer GameStop (GME) was also sharply higher.